Stock up & Save on your favourites with these value gift packs! To give you Redken products that work together to give real results, tailored to your hair type. 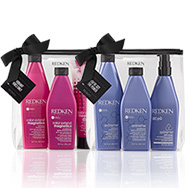 These Redken packs also offer exceptional value for money! 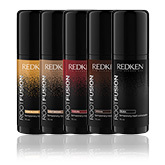 Redken Styling products offer salon-professional results for any and all types. Whether lacking in volume, shine and texture, or looking to keep your curls or frizz under control, the Redken Styling range covers all hair care bases. Inspired by the urbane landscapes of New York City, choose one of these high-impact sprays, mousses, gels and waxes to get your hair styled to perfection. Redken Frizz Dismiss is specifically designed to combat against frizz and humidity. Hair is conditioned, smoothed and manageable. Redken All Soft is the ideal solution for dry, brittle hair. To help restore complete softness and manageability. Redken All Soft hair products contain avocado oil, proteins and amino acids to ensure hair is smoothed, conditioned and moisture is sealed. The Redken formula is enriched with the exclusive Keratin Enrich Complex which works in conjunction the Interlock Protein Network (IPN) to help provide targeted care and sublime conditioning. 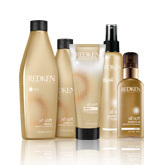 Redken's All Soft Mega range was created to cater to those with mega dry and puffy hair. The range feature the Superfood Nutri-Complex - a blend of cactus extract, aloe vera, and sacha inchi oil - that helps deliver intense hydration, replnishment and control for hair that expands uncontrollably as a result of dryness. With the range featuring the first professional hair sheet mask, All Soft Mega Hair Sheet Mask, hair can be revived with a 10 minute weekly treatment from the comfort of home. If you're a fan of the All Soft range, but find yourself needing something with a little more va-va-voom, why not try All Soft Mega? Proud owner of gorgeous grey or silver hair? Show the world your shade with Redken's Color Extend Graydiant. Anti-yellow, all silver brightening and nourishing, the Graydiant collection is perfect for enhancing grey and silver hair. Boosted with amino acids and custom direct dyes to nourish and strengthen grey and silver hair, the formulas work together to progressively brighten hair for 2x stronger and more radiant grey hair. It's time to ditch the dullness! Don't lose the colour you’ve always wanted. 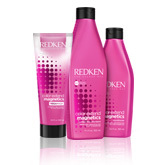 Seal it in with new, revolutionary Redken Color Extend Magnetics. Acting to seal in colour vibrancy while protecting colour treated hair so that it effectively holds colour longer and remains fresh and shiny. Redken Extreme provides incredible strength, repair and protection. For chemically or otherwise damaged hair. Redken's exclusive 3D Repair Complex deeply nourishes and replenishes hair from the inside ensuring beautifully healthy, manageable and shiny hair. A leave-in haircare treatment to protect, repair and beautify hair, leaving it easier to style and looking full of shine. Redken Diamond Oil Glow Dry reveals for show-stopping strength and shine. The next generation in oil-based hair care, Redken Diamond Oil Glow Dry is suitable for all hair types to create a lightweight, shiny and beautiful blow dry. The multi-purpose haircare hero, Diamond Oil Glow Dry Enhance Oil, can be used as a pre-shampoo treatment, an overnight treatment, a pre-blow dry treatment or as a finishing product for beautiful, head-turning shine. Create bundles of high-rise volume and leave your hair lifted! Split into two ranges - High Rise and Beach Envy - Redken Volume allows you to create textured beach waves with natural movement and body or create long-lasting fullness with a lightweight feel! Discover the deep-cleansing, sulfate-free of Micellar Shampoo & Clean Touch Conditioner! Micellar shampoos gently washes away dirt, pollution, product build-up and excess oil without stripping natural moisture to leave hair feeling bouncy, fresh with an airy finish. The micelles (cleansing agents) act like a magnet collecting unwanted oil and dirt whilst neutralizing odours (cigarette smoke, pollution etc) to easily wash away without stripping moisture or hair colour. Unlike clarifying shampoos, micellar shampoos can be used every time you wash your hair. (Defy) and advanced stages (Retaliate) thinning hair. 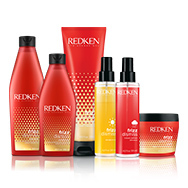 Redken Curvaceous is a complete collection of haircare and styling products. Specially formulated to define your curls.The newest addition to the Redken Family, uses Redken's exclusive Curl Memory Complex and the Interlock Protein Network (IPN) to help strengthen, moisturize and reactivate shape for increased manageability, frizz control and amazing shine. Cover up roots inbetween salon appointments and on the go with Root Fusions. 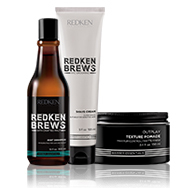 Redken For Men has been developed as the complete male grooming regime. Get dramatic results whatever your hair type with Redken hair products for men. Designed to promote stronger hair and a balanced scalp. 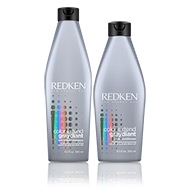 Redken have developed formulas for cleansing through to styling. Redken Shampoo and Redken Conditioner for men help drive protiens and energy into your hair, perfect for deep rooted cleaning and moisture. Then simply choose the Redken For Men Styling products to give you the ultimate control over your look. Define your style, whether you want subtle or extreme, with Redken. Attack and control dandruff with the Redken Scalp Relief hair products. Utilising the exclusive Calming Suspension System which consists of eucalyptus and liquorice amongst other active ingredients this range works to effectively yet gently soothe and de-stress the scalp while adding vital moisture to hair, resulting in a happy, healthy head. Whether you’re plagued by dandruff, an overly sensitive scalp or excessively oily hair there is a product in this range that will control and soothe the problem while still caring for your hair and skin. 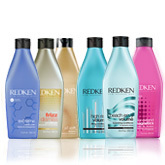 Redken offer a range of Shampoos to suit all hair types. Whether your hair is tortured and dry or skinny and limp or somewhere in between, Redken hair products offers a solution for everyone. We have put all Redken shampoos into one category, so you can quickly and easily find the best shampoo to fit your hair type. 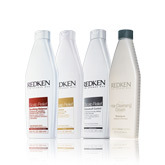 Each Redken range offers a hair conditioner to complement the matching shampoo. We have put all Redken conditioners into one category, so you can quickly and easily find the best conditioner to fit your hair type. 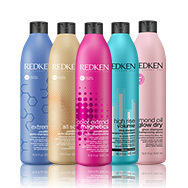 View all Redken Hair products in one place. Redken Laboratories were founded in 1960, and since then, the brand has worked its way to the top due to its frequent innovations in the world of hair care. The company was built from the inspiration of a dynamic, entrepreneurial American actress, Paula Kent, who was extra sensitive to most of the products makeup artists and hairdressers would use. She wound up feeling incredibly frustrated and so, with the help of her hairdresser Jheri Redding, began Redken—which started with just three products, and an intensive education programme for hairdressers about the chemistry of hair and skin. No Blow Dry, No Problem! Take a break from heat styling. Then Redken Color Extend Blondage is for you - #TeamGorgeous love it too! Which products have come out on top? During the 1970s and 1980s, the company was an international leader in product technology. In 1993, the company was bought by L’Oréal, and now resides at its headquarters in New York City. It is now a global leader in professional hair care products and services, and the company is energised with talented people, strong partnerships with the best hairdressers, and superior development programmes. Beginning in 1960, Redken revolutionised the professional salon business by introducing the concept of protein reconditioning. 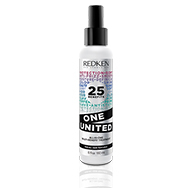 Based on the evidence that hair is composed primarily of proteins, and can absorb topically applied proteins, Redken developed new protein-based products. Salons were suddenly able to condition hair internally and for the long-term, rather than just camouflaging damaged hair. Redken soon began to develop patented protein technologies, and now holds over 60 global patents on products and ingredients. In 2008, Redken was announced as one of the 'Icons of the American Marketplace'. It was also the only hair care label to feature in the Random House Top 800 brands for consumer excellence. Their commitment to formulating scientifically superior products for the global salon community continues, and as fashion and street styles constantly change, modern hair needs will only enhance Redken's strength and standing in the hair care industry. Gorgeous Shop has collated your favourite Redken hair care products, including Redken shampoo and Redken conditioner, so you can shop with ease!